William S. Phillips Handsigned and Numbered Giclée Canvas:"Reflections"
Edition Size: Artist Signed and Numbered limited to 75 s/n editions. Image Dimensions: 12"w x 24"h.
About the Art: "I was nine years old when my father sent me a postcard from the Grand Canyon," says Phillips. "From that time on, I have been fascinated by its grandeur and ever-changing moods. I have seen the Grand Canyon from numerous vantage points- through rumbling summer thunderstorms and howling winter blizzards, from the sky above and along its myriad of trails to the river below. It is always an awesome and humbling experience and one that must be preserved for future generations." 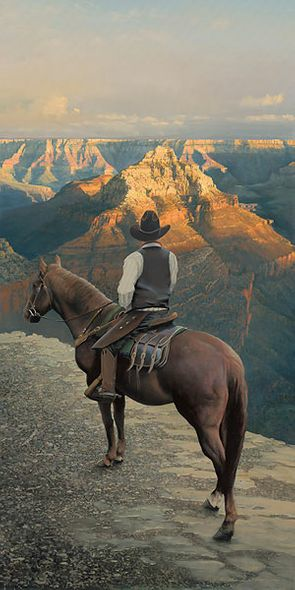 During his time as an Artist in Residence at the Grand Canyon in 2004, Phillips worked hard to interpret the park's purpose as a place of pleasure and its importance as a national treasure. His magnificent works from that period, including Reflections, testify to the majesty of the American landscape.